Communicating with the world gently and fearlessly, our awareness is sharpened and we find the open clear sky of mind—a delightful source of wisdom and uplifted energy. We trust our nature enough to let go into the present moment. The program includes meditation instruction, talks by the Director, group discussions, guided contemplative practice, and individualized instruction. Pre-requisite: The Art of Being Human: Shambhala Training Level IV. Pre-registration and payment are required. Please register for this program below. Shambhala Training is a series of contemplative workshops, suited for both beginning and experienced meditators. The simple and profound technique of mindfulness and awareness is the basis of a secular path of meditation, which can benefit people of any spiritual tradition and way of life. Shambhala Training is the study and practice of Shambhala warriorship—the tradition of human bravery and leadership. This path shows how to take the challenges of daily life in our modern society as opportunities for both contemplative practice and social action. Shambhala Training is inspired by the ancient legend of the Kingdom of Shambhala, said to be a society which drew its gentle and fearless sense of social responsibility from the practice of meditation. The legend of the Kingdom of Shambhala has been a guiding vision for many centuries in Asian culture and has parallels in Western traditions. All aspects of our daily life and society—family, commerce, education, the arts—can be permeated with a sense of sacredness. This sequential program is part of an integrated curriculum called the Way of Shambhala, that offers an experiential overview of meditation practices, wisdom teachings, and contemplative arts rooted in the ancient traditions of Shambhala and Tibetan vajrayana Buddhism. 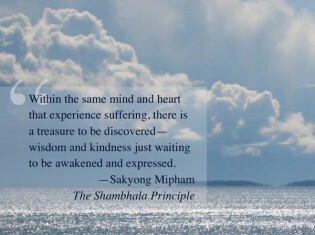 This program of workshops and courses is taught by experienced Shambhala teachers. The unfolding stages of the Way of Shambhala curriculum represent the natural progression of awakening in our lives. The Shambhala Heart of Warriorship (Levels I-V) can be practiced as an independent series of workshops. Shambhala Training is organized into five weekend workshops that include meditation training and practice, talks by senior instructors, personal interviews and group discussions. Levels I-V provide a strong foundation in mindfulness-awareness meditation practice, emphasizing the development of genuineness, confidence, humour, and dignity within the complexity of daily life. The workshops are recommended for new and experienced meditators, as well as for those looking to enrich their existing spiritual path. With trust in basic goodness and daring to experience the sharp edge of reality, we move forward with gentleness, increased awareness, and inquisitiveness about the world, as it is. We can extend ourselves to others fully and with kindness. Palm Beach Shambhala remains open entirely due to the generosity of its members and program participants. It is our sincere wish that no one be prevented from participating in programs at the Shambhala Center due to financial constraints. Our Generosity Policy helps make programming available to all those who wish to participate. Tuition fees reflect our costs to hold a program, but if the price is an obstacle, the Generosity Policy allows you to offer as much of the fee as you can based on your individual circumstances. To utilize the Generosity Policy please register in advance of the program you wish to attend. We cannot accept Generosity Policy registrations at the door, so please make arrangements in advance.